The 43-year-old battled rough, shark infested seas to become the first windsurfer to cross the pacific on Monday. She was welcomed by a crowd of thousands including Polynesian dancers. 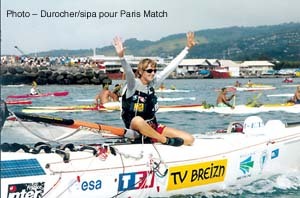 Frenchwoman Raphaela, had help from a back up vessel which kept a distance of 600ft from her 25ft sailboard. The complex board had a pod for her to eat in, a watertight tube for sleeping, solar cells and a satellite navigation system. The crossing took 89 days and seven hours covering a total distance of 4,455 miles to complete her journey. Le Gouvello, who has already crossed the Atlantic and Mediterranean by windsurfer and is planning to continue her expedition next year by sailing from Tahiti to New Caledonia and then New Caledonia to Brisbane.